You can choose website interface, SMS & E-mail language. Remember to click Save after any changes. Maxiumum conversation duration - duration of the whole conversation in seconds. If exceeded the call will be hanged up. Scheduled calls per timestamp for account. Please note that this limit applies only for widgets with "Busy mode" off. To change limits click "Request limit change". The new window will display and you will have to enter the new value and case description. Click Request limit change and your enquiry will be sent to us so we could change limits for you. Here you will find such information as your current plan and its expiration date. You can upgrade anytime you want - just click the button Change plan. The new window with available options will display and you will have the possibility to choose the one you are interested in. Then click NEXT and you will be redirected to the new window and asked for such details as full name, country, city, address, ZIP code, billing period and payment system. If you fill the form as a company you will be asked for tax number also. Then click Proceed to payment. Here you can see the history of your payments. There are such information as ID, transaction ID ("manual" if you received the invoice or the special code if you pay through panel by PayPal, DotPat or bank transfer), price, payment date, type (subscription or onetime payment). You can download the invoice by clicking red button. In this tab you are able to enter your invoice details: company name, country, address, Vat ID/Tax number, city, ZIP code. On that basis your invoice will be generated. You can change those detail afterwards. If you have received a promo code you can make use of it here. Enter the code and click APPLY. If you have already used any code you will find on the list (with such information as: code, limit increase and date of application). Here you will find the list of all numbers which have been ever added on your account. There are such details about verified numbers as: ID, phone number, verified timestamp. In this tab you can verify the number (as well as in My team tab). You can also cancel verification by clicking "Delete" which you will find next to each verified number. 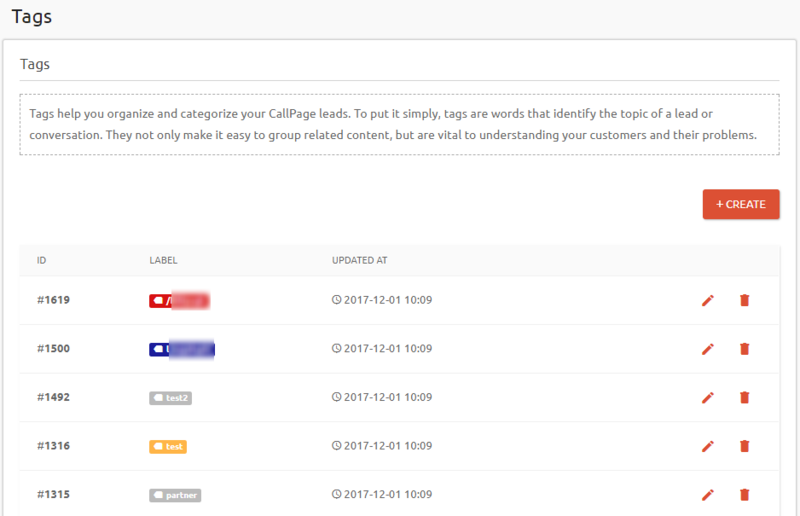 Tags help you organize and categorize your CallPage leads. To put it simply, tags are words that identify the topic of a lead or conversation. They not only make it easy to group related content, but are vital to understanding your customers and their problems. You can find such information about existing tags as: ID, label, date and time of last update. You can edit tags by clicking the pencil icon or delete them (bin icon) anytime. To create new tag click the button +CREATE. 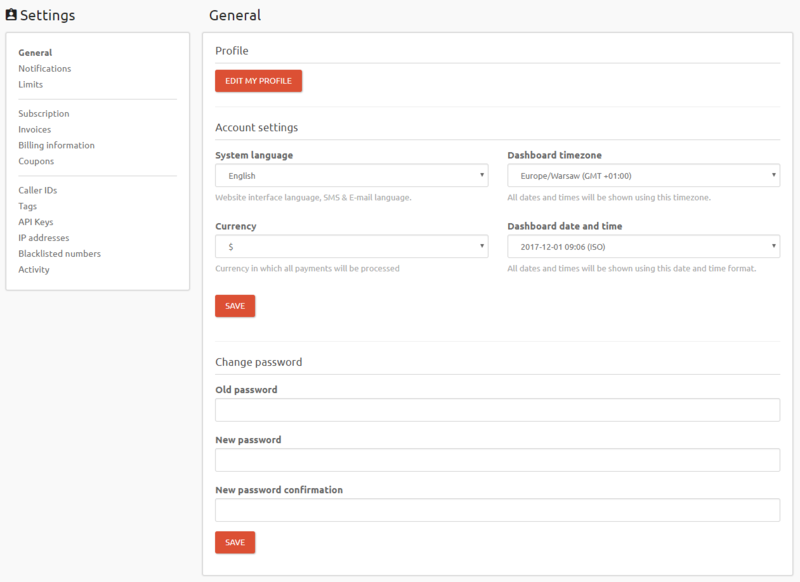 The new window will display and you have to enter label (a short name for your tag which helps you to identify content). You can also select tag color to differentiate between tags. You can find such information about existing API Keys as: description, date of creation, date of last use. 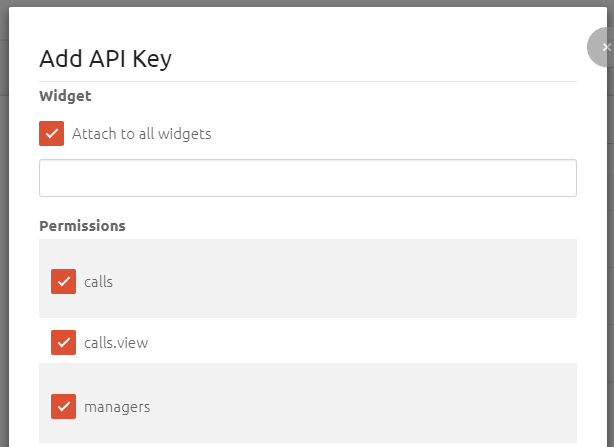 To create new API Key click the button CREATE NEW API KEY. 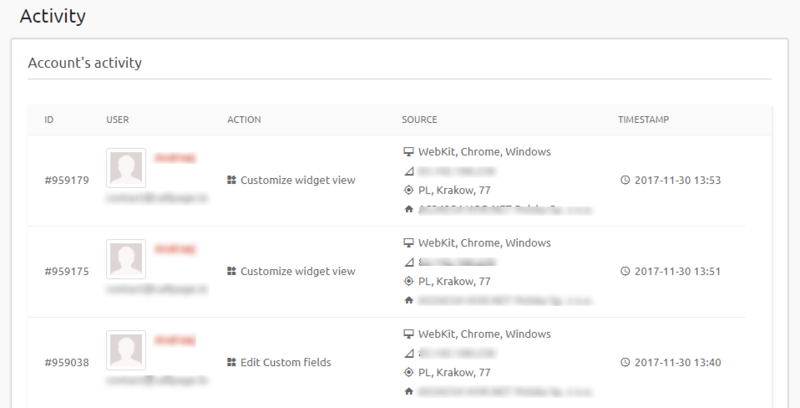 The new window will display and you will have to choose widgets to which API Key should be attached, Permissions and Description (optional). You can add an IP address to blacklist or white list. CallPage won't be displayed to users with blacklisted IP addresses. White listed IPs have no restrictions. Blacklist is anti-spam and security filter. IP is blacklisted when someone orders a lot of calls and doesn't answer them. It can happen during tests. To add IP address to white or black list just enter the number to empty field, choose whitelist or blacklist and click SUBMIT. Afterwards you can remove IP from the list by clicking bin icon next to it. Each IP on the list has the following information: ID, type (white or black list), date of creation. You can also add a phone number to blacklist. This user won't receive any calls from CallPage any more. Each number on the list has ID and date of creation. To add number to the black list just enter the number and click ADD PHONE NUMBER. Afterwards you can remove it from the list clicking bin icon. Here you can learn about your account's activity. You can find the following information about each activity: ID, user, kind of action, source, timestamp.